I've decided to pursue my doctorate degree, and with family additions to be expected, giving up the thing I love most for life's other responsibilities is the only reason valid enough for me to have this sale. 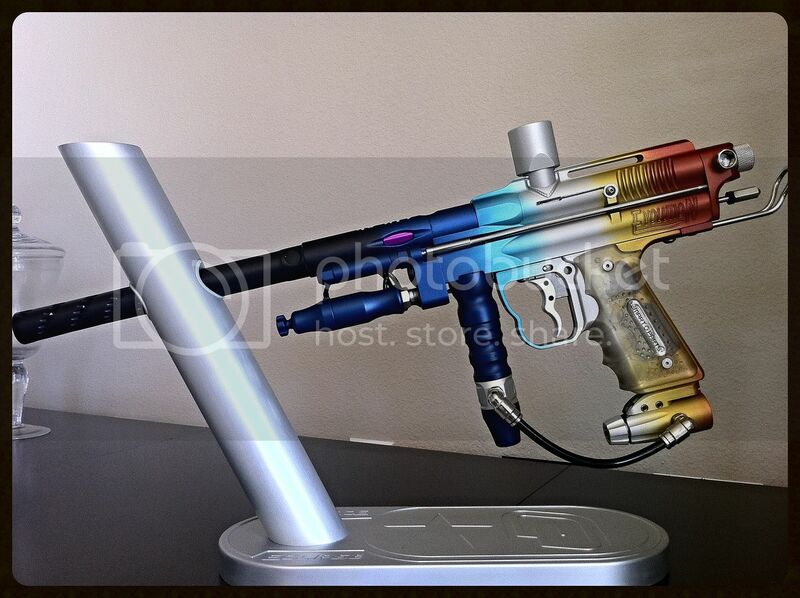 The original design had something that looked like flags on the side but, after producing that, the team came up with the 3 teardrops instead for the production guns. Only one of its kind. I don't think Sacramento XSV was ever sponsored or formally required to use Matrix markers, so this is a pretty special specimen. Made by Duane Parsons for Rich Telford as a present from his wife, Gina. Duane is the same man responsible for the original work on the Ironmen Matrices. His nickname, Mr. 2tenths, represents the measurement of two ten-thousandths of an inch. A ten thousandths of an inch is as small as machinist measures by hand and is the amount that the machines that make the pieces can hold parts to. That is to say the machines themselves can hold no better than 2 ten thousandths of an inch. What he is saying by using that name is that he machines to perfection. Thanks to Jack Rice (of Alien Paintball) for that nickname information. A grizzly bear milled on the passenger side, representing California's state animal. XSV is milled into the trigger guard. 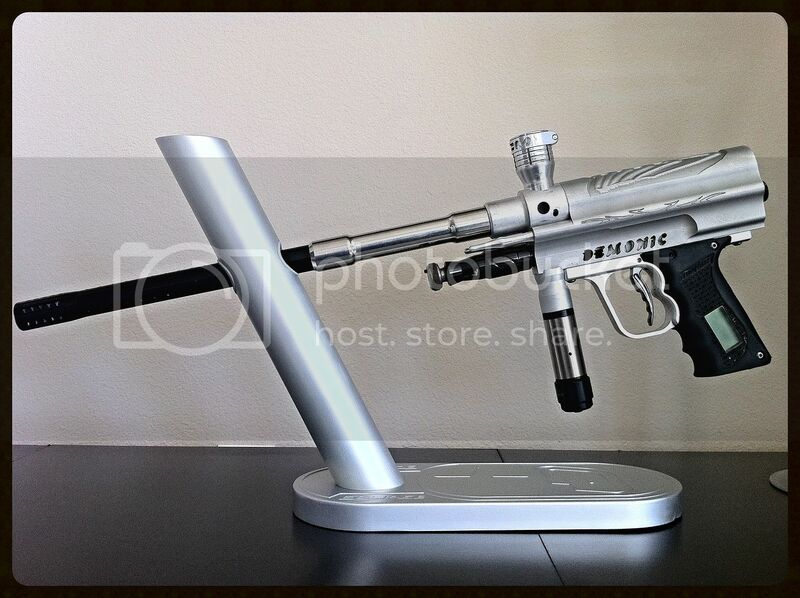 That is an o-l-l-l-d gun!! 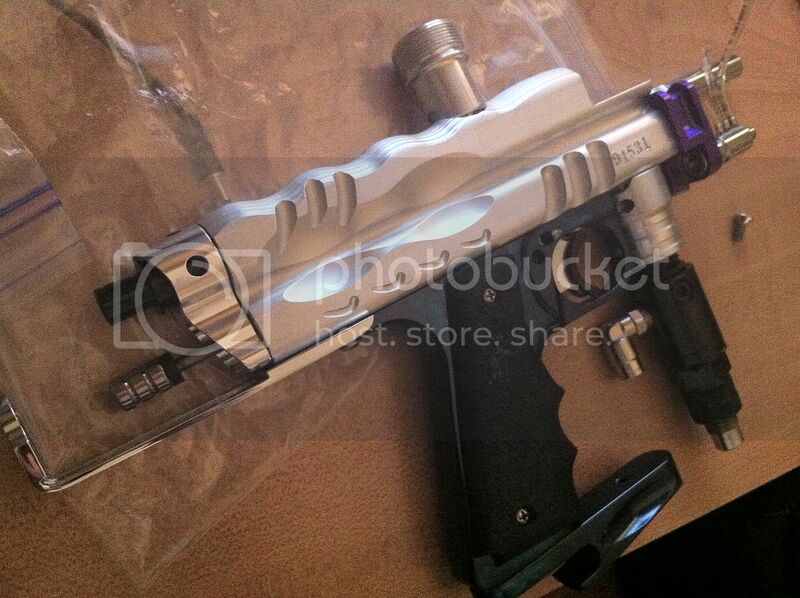 Jason Chipley did the machining on it for sure, but I do believe that was Garett Maxwell's gun. He was our (CCM's) first tech and design guy who worked and played forever with Jason. ...where did you pick that up at? 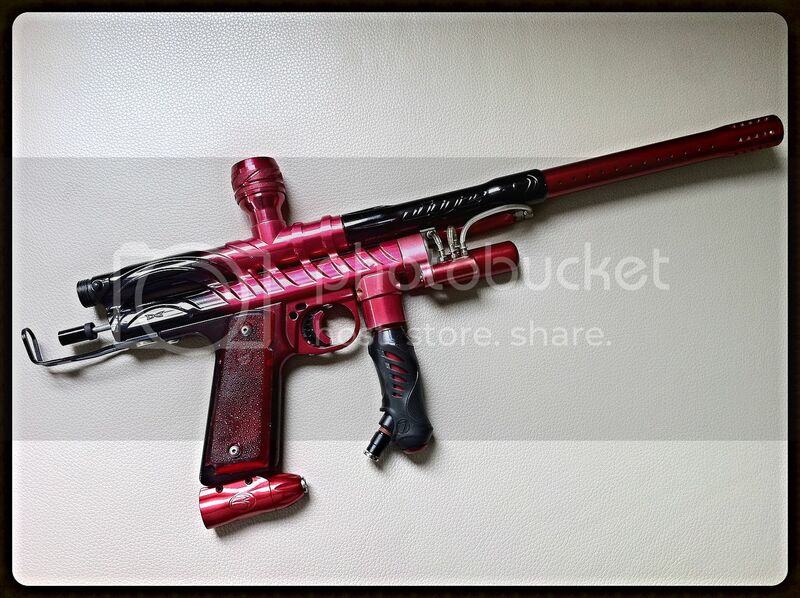 This explains why it's one of the nicest shooting and feeling guns in my collection, no contest. 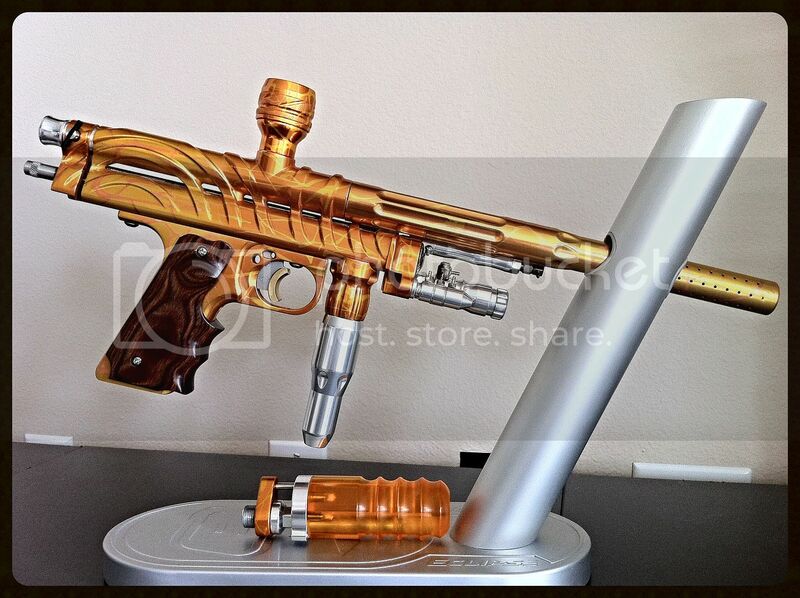 Young Choi, owner of Aces High Paintball in Washington (circa 1999) was responsible for making these. Now, this marker was one I sold a long time ago and one of the few I regretted doing so. As luck would have it, it's come full circle and is now in my possession again in the same condition I sold it in. I'm really glad to have this one back. There are a total of 17 floating out there. 10 of the first run, 7 of the second. Wolf13 owned one from the first batch, but yours is one of the second batches that we made. Everyone loved the color scheme and they sold quite fast. We used different parts as far as the front block goes and used a screw to balance the sear spring better. We did away with with trying to polish the trigger plate and went with ANS trigger plates as we tried to get the shortest and snappiest trigger pull. We also did more extensive milling on the second batch guns. This gun is LIGHT. It's on par with a twister, if not lighter. Only 7 exist. Planet Eclipse made 12 of these Aurora autocockers. 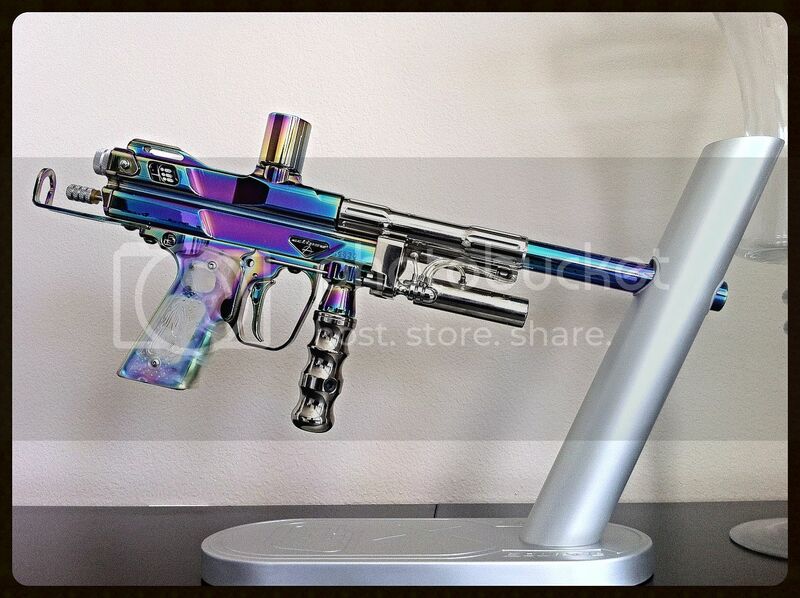 The process called spectrum physical vapor deposition(?) causes a very high and narrow amount of electricity to pass through the metal to give it its prism finish. It is NOT the same as "oil slick". I have yet to confirm the rumors that of the 12 made, 5 left the factory as undrilled mechanicals. Planet Eclipse stopped doing this process because it was just too expensive for the return they expected. Cesare Pizzo's Westwood killer, the LE supercocker is an absolute beast of a high end cocker. 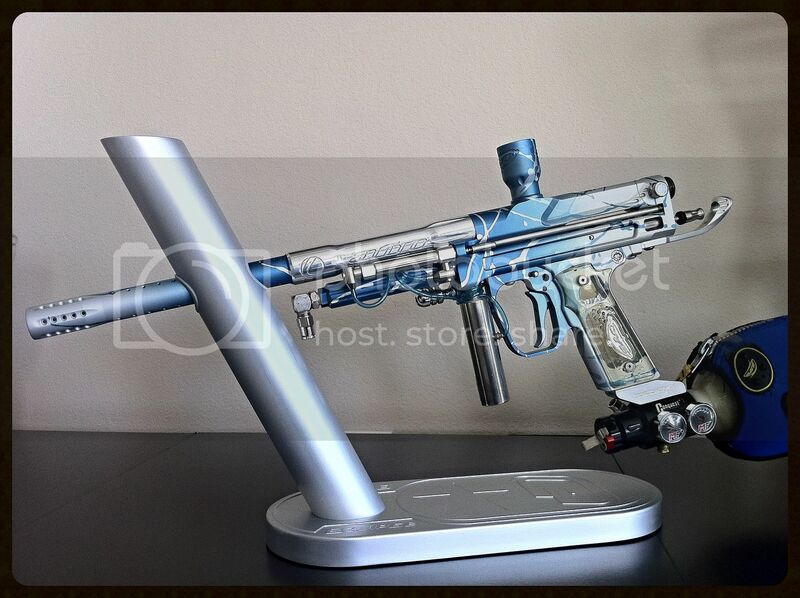 Built completly to order, with a heart attack price of $1850 ($1975 with black ice unireg) without HPA system or loader, the LE is one of the most expensive paintball guns ever to hit the market. Using some of the best parts on the market (including P&P's excellent 45 frame (front and rear trigger guide screws) that even BBT adopted), it could be had with virtually any option for pnuematics and internals. I have only seen pictures of four of the LE's (the lesser super's are far more common, though still very rare), and only two for sale in the last few years (by the same seller). Finding an Aurora is easier then finding one of these, especially in mint condition. P&P also used some of the most distinctive annoes for their supercockers including a multicolor acid wash or splash with a faded splash over top. For anyone keeping track, typical price for something like this could easily approach $500. Like all P&P cockers, this has the edition engraved just in front of the feedneck "SuperCocker 99" on one side and "limited Edition" on the other. Trust me when I say this is a beautiful anno, and well ahead of its time. 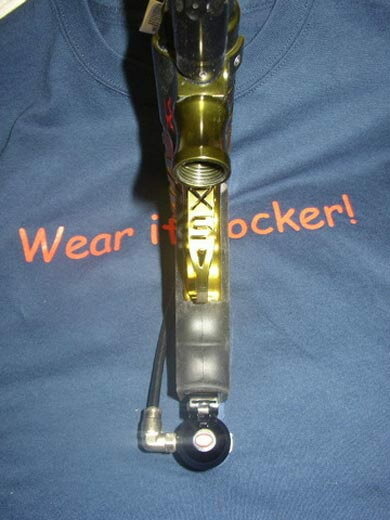 According to the original owner, this special order Super Cocker ran him nearly $4,000 out the door. I don't want to necessarily sell these, and the price reflects that. This is one of those pieces that is so unique in history and what its accomplished, that one can't help but feel a little 'starstruck' or 'empowered' while holding it. 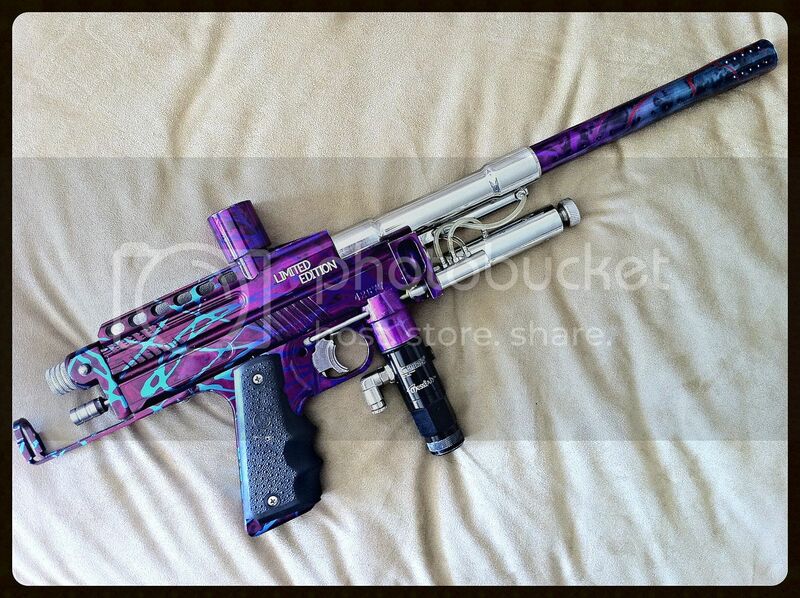 This is Gary Noblett's '98 Team Aftershock BBT Custom he used to help Aftershock become one of the most prominent and dominating teams in paintball history, winning the '99 NPPL World Cup and appearing in the video PUSH (where Gary is regarded as 'the best cover fire player to have ever played the game'). Built from the ground up by BBT's Danny Love, the trigger on this is perhaps the culmination of the Shocktech philosophy, it is incredibly smooth and light. I have to say, this is probably the fastest mechanical 'cocker trigger I have ever shot. The anodizing fades from a blue to a dark purple at the back, and the match anodized stock continues the fade in full extension. The little logo does not say "Shocktech" like the rest of their autocockers, instead it says "Team Aftershock" on both sides. The .685 Boomstick is also custom milled to match the front block. This was a performance piece that emphasized performance; note the brass ram, extra high smokestack and vented milled feedneck, and dual wire detents both in front of and behind the ball (Just like the BBT SFL Prototype): A novel concept at the time. Some guns are so unique and rare that their existence is nearly legendary, and to own one is a dream. Satco 700, Pheonix, RTP Auto-Viper, Revenge V3; all names that make the knowledgeable sit up and take notice. 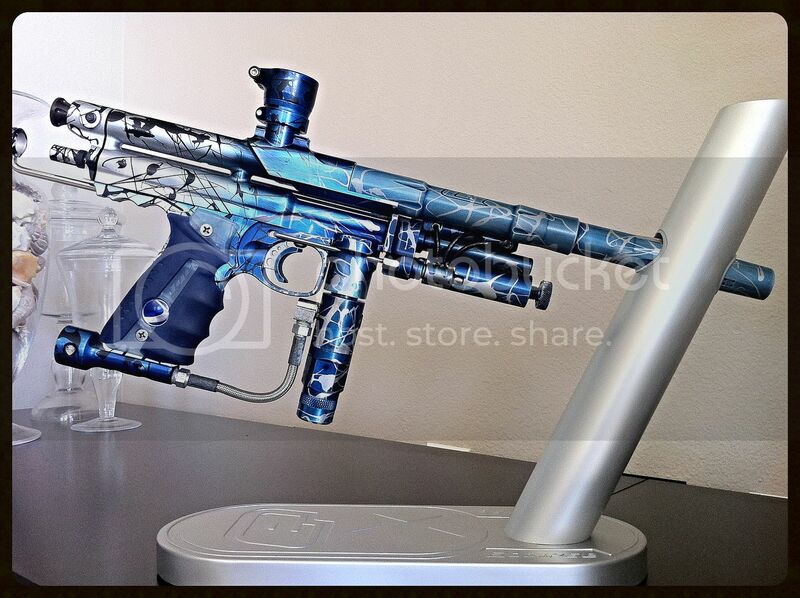 To a fan of AKA, cockers or oddballs in general, the V3 has a mystique all its own. Although two or three are rumored to exist, according to a former owner; Mike at Splat Attack built only a prototype and this one. The prototype was then destroyed. I have heard a lot of opinions and rumors stating otherwise, but I know I have never seen another one, though it would not surprise me if Mike kept one. Although the the rear mounted ram is not new (Eyeball, Whither's and Nestle's work predated it by a few years), it does feature a few interesting evolutions, namely the internal air passage as well as the enhancements of the Revenge line. The roundbody Revenge V2 LE's introduction at the same time became the cap of the Revenge line and the V3 became just a footnote in history. Everything for sale as is. Everything in great condition unless otherwise noted. Some guns require tuning and oil to your preference. Some items like ULs or Sidewinders/2Litres aren't included. Last edited by Gunhero5; 04-28-2016 at 03:23 AM. Prices aren't absolutely firm. Motivated seller! Wow, that's an unbelievable collection. Just... wow. That Bushmaster is killer (something I never thought I'd say)! Hopefully you're holding on to a few guns?